Rubber Room Ramblings: FRESH VINTAGE, FREE FROM STAMPIN' UP! I LOVE FREE! That's what you get from Stampin' Up! during Sale-A-Bration (going on now until March 31st). With every $50 you spend you can pick one item from the SAB Catalog for FREE! 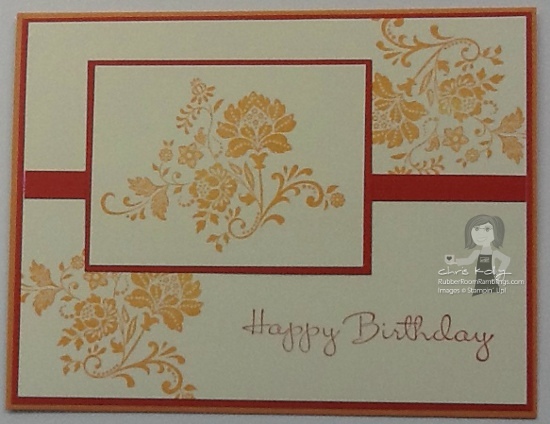 This is a quick and clean card made with the Fresh Vintage Stamp Set. I used two of the 2010-2012 In Colors from Stampin' Up!, Poppy Parade and Peach Parfait. This is a very easy card to make and the Peach Parfait really makes the Poppy Parade pop! ORDER YOUR GREAT STAMPIN' UP! PRODUCTS HERE!